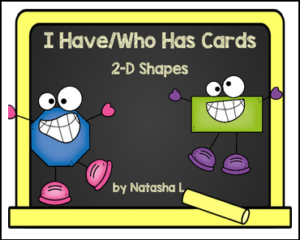 Enjoy this free game in your smaller group of students. I’ve deliberately kept it simple to conserve ink. Shapes include circle, oval, triangle, trapezoid, square, rectangle, rhombus, pentagon, hexagon, and octagon. This set includes a “cover” card and a teacher reference card. Please, do let me know how you like this. A Spanish version, also free, is forthcoming. Depending on the response, I’ll be adding to my selection of I Have/Who Has games.